Snow guards and snow rails protect your gutters and landscaping from falling sheets of snow. Because most homeowners think very little about their roof, they are often shocked when their roof has accumulated enough snow and ice to set off a minor avalanche right on their doorsteps. 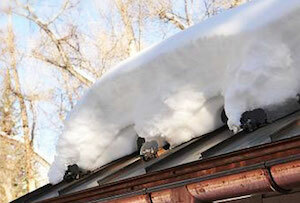 Depending on how much snow is sitting atop your roof, unprotected, serious injuries can also occur. Therefore, installing snow guards or snow rails is a must for every homeowner living in areas with snowy winters. Here at Global Home Improvement, our metal roofing experts know the best methods and techniques for installing snow guards or snow rails for your Pennsylvania, New Jersey, Delaware home. Interested in finding out more? Schedule a free estimate with us today! What are snow guards and snow rails? Both snow guards and snow rails are obstacles that are designed to prevent the roof-load of snow from dumping or avalanching all at once. When installed on the roof, snow rails looks like cluttered lines with spaced out posts to keep massive collection of snow and ice from sliding off the roof simultaneously. Snow guards, on the other hand, come in different patterns and quantities depending on the shape, size, and pitch of the roof. Some snow guards take on a sharp triangular shape that make them look like shields on the roof, while others assume tent-like forms. While metal roofs do not suffer damage or dent from heavy snow as is the case with asphalt shingles, their interaction with accumulated snow and ice makes them a great candidate for avalanches. At Global Home Improvement, we offer high quality snow guards and rails that will effectively keep major snow fall from occurring. Our snow guards, which come in a wide variety of styles and colors, are the perfect match for any kind of metal roof. Whether you have a standing seam metal roof or a metal roof with a steep slope, our snow guards can add to your home’s curb appeal by being a great accent to your roof design and architecture. For homes with a more contemporary metal roofing style, we recommend using our snow rails to prevent snow and ice from sliding off your roof in mass quantities. The snow rail systems at Global Home Improvement are made of non-penetrating cast aluminum castings that can be efficiently attached to your metal roof. Installing snow guards for a metal roof is a preventive measure that will protect your loved ones and your home from any unnecessary additional damage. As always, Global Home Improvement’s professional team will work closely with you to ensure that your high-quality snow guards are professionally installed on your metal roof. Schedule your free estimate in Doylestown, Ardmore, Cherry Hill and nearby today!